Unique Self is the essential portal for the democratization of enlightenment. It’s a term I first began deploying in my doctoral studies at Oxford almost a decade ago, and it has become an essential dimension to World Spirituality teaching. Democratization of enlightenment doesn’t mean everyone is enlightened in an equal way. It means that the possibility of enlightenment is what William James called a genuine option for every human being who aspires to it. Enlightenment is not only the province of the elite. It can expand beyond the narrow sectors of the meditation hall in Nepal or Brooklyn, or the back streets of Jerusalem’s ultra-Orthodox neighborhoods where the pious Kabbalists sit and chant. Enlightenment becomes part of the fabric of every awakened life. That’s a big deal. Where we are in the world today is a place where there is such a crisis of resources, meaning, direction, hunger, imagination. It threatens the survival of the planet Earth, this epoch of humanity as we know it. It is oft said that a set of problems created at one level of consciousness can only be solved at a higher level of consciousness. Generally, we understand that is true of the individual. The individual creates a set of problems at one level of consciousness, then has to evolve to a higher level to solve those problems. But it’s also true of the community, the public culture, the We-space. Planet Earth has become a We-space. You go on to Google Earth and there’s no place you can’t see today. It’s getting smaller. We affect each other. We’re completely interpenetrated. The old teaching of the enlightenment teachers of the interconnectivity of the All with the All is no longer something you realize in meditation or chant; it’s actually an obvious truth of reality. The esoteric truth of the interconnectivity of the All with the All a thousand years ago has become the obvious truth of interconnectivity in our lives. To solve the radical problems of today, we need to up-level our consciousness as a community. We need to up-level the consciousness of our We-space. And we can only do that in an Internet, intertwined world where billions of people affect the We-space; this is to begin to enact the possibility of the democratization of enlightenment. To make enlightenment in the public culture and social mind a genuine psychological / spiritual possibility…Again, that doesn’t mean everyone is enlightened at the same level. It means the possibility of enlightenment awakens. Unique Self is the ultimate democratic principle. Our Unqiue Selves are all different. Everyone’s got one. Just like “one person, one vote”—one person, one potentially enacted Unique Self. That calls a person in a different way. When I am called to my Unique Self enlightenment, which is to awaken to my Unique Self, I begin to become awakened, alive, and aware in an entirely different way than if I am called to experience myself as pure consciousness. The old enlightenment doesn’t address most of humanity. Most of humanity is looking intuitively and correctly at how can I enact the unique meaning of my life. If I do that in a narcissistic way, then I’m lost in ego and separate self. I’m alienated. But if I do that in a healthy, awake, alive, aware way, then I want to be part of All That Is, and thereby to express all my unique gifts. So uniqueness opens the portal of enlightenment to the larger population because uniqueness is a democratized concept. As long as you’re talking about a narrow True Self enlightenment, most people feel excluded from it. When you begin to talk about a Unique Self enlightenment, people awaken to the conversation and it becomes interesting and then it attracts attention. Once it grasps the heart, you can explain it in a new way that if you want to awaken your Unique Self, you must evolve beyond exclusive identification with ego because ego distorts your Unique Self. Ego seeks to satisfy itself, so it might choose shortcut paths to fulfillment that don’t really do the work of identifying, living, and giving your Unique Gifts. Moving beyond ego is not only an invitation to awaken to pure consciousness, but to an awakening of your Unique Self, the great desire to move beyond ego, to identify with True Self, essence, and to enact and awaken further with my awakened Unique Self, which gives its gifts as part of a larger evolutionary context. 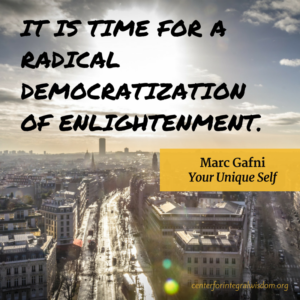 Unique Self and the democratization of enlightenment are inextricably linked. They are part of a larger cluster which is essential to an emergent World Spirituality. You’re invited to join us on Saturday mornings from 9:00-10:00am PT, beginning this Saturday October 29th for Evolutionary Church: A communion between new humans participating in the evolution of culture and consciousness. Evolutionary Church is where we gather to articulate, discover and experience the living memetic codes within our very being that are guiding us towards a positive future and evolving public culture. 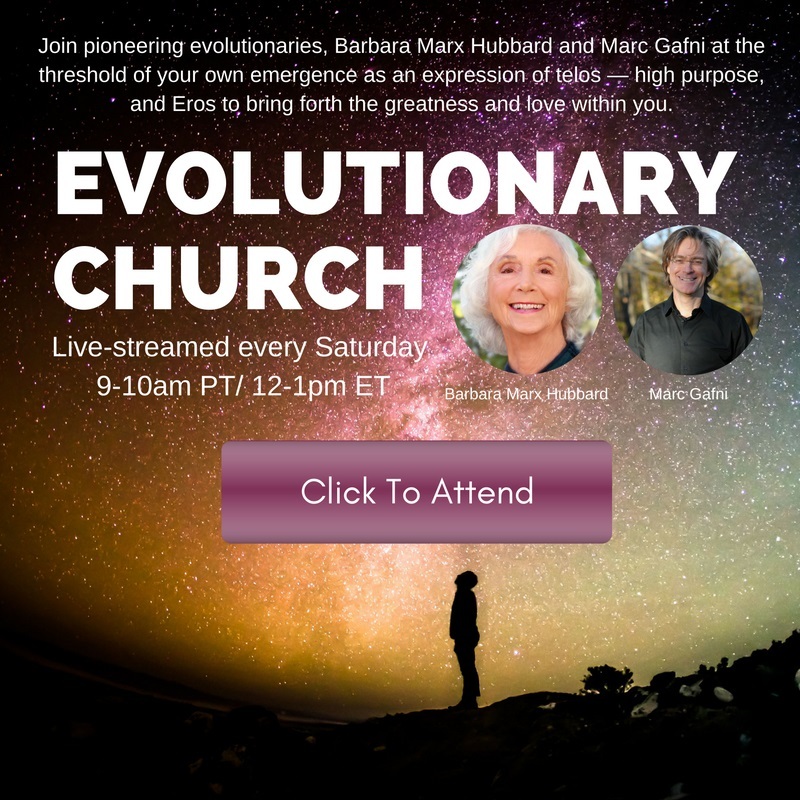 Evolutionary Church is an interactive, live-streamed event during which Barbara Marx Hubbard and Marc Gafni will usher us into a resonant field of allurement and love that serves as a potent catalyst in revealing the direction of our personal and collective evolution. Each week Barbara and Marc will introduce an evolutionary theme and articulate a message based that theme. Then YOU will be invited to speak your voice, as part of the Unique Self Symphony, into what Teillard De Chardin called the Noosphere, the evolving consciousness of reality – enabling it to get it’s collective eyes. The next step is to wake up. Wake up to your true nature as an irreducibly unique expression of outrageous love. Who are you? You are an outrageous lover. What does an outrageous lover do? An outrageous lover commits outrageous acts of love. Which outrageous acts of love does an outrageous lover commit? Those that are a function of your Unique Self. It is only your outrageous acts of love emergent from your Unique Self which come together with other outrageous lovers committing their unique outrageous acts of love that have the capacity to heal the entire story. That, my friends, is the basis for a radical hope. It’s the basis for a realistic but radical optimism. For it is the natural expression of human nature and evolution itself. The sacred technology of evolutionary intimacy–another way of saying outrageous love—has the potential to create heaven on earth. I have spent the last several decades intensely searching and studying everything I could lay my hands on, reading tens and tens of thousands of pages in every tradition, pre-modern, modern, and postmodern. This is I know, way and above, the most realistic and hopeful vision of the evolution of love that we have today. We live in a world of outrageous pain. The only response to outrageous pain is outrageous love. Let’s awaken together and transform our world. 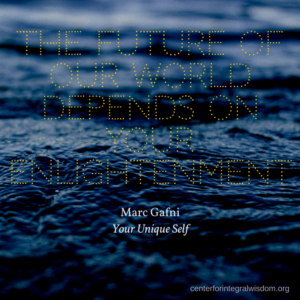 Taken from a first draft text from the forthcoming book The Path and Practice of Outrageous Love by Marc Gafni and Kristina Kincaid, this series elaborates on a critical advancement of the Unique Self Dharma that Dr. Marc has developed after Your Unique Self was published. To start from the beginning go here and then follow the To Be Continued links. Everywhere one looks there is outrageous pain. There is public pain and private pain. Seventeen million slaves exist in the world today—that’s more than there were at the height of the slave trade in the US two hundred years ago. Today 17,000 children die every day from starvation and twenty million children die of starvation every year. Billions of people are brutalized by loneliness and alienation. The list of public outrageous pain goes on and on. Then there is the private outrageous pain. This is the stuff from your personal life that hurts so badly. It may be something that was done to you or that you did. It might be the pain of betrayal, where you were either the betrayed or the betrayer. Or both. It might be the pain of a part of your life that is unlived or unloved. When you really face the pain, it is excruciating. So your turn your face away and get busy. We’re so frightened by outrageous pain that we’ve completely shut down. We close off our hearts because ordinary love cannot hold the pain. The problem is, that we only have one heart. We cannot consistently shut down our heart and still remain openhearted. We think that we can selectively open our heart only to the channels of life whose programming appeals to us. That, however, is not the way the heart is designed. When you shut down you lose the signal and nothing comes. The result of repeatedly closing our hearts in face of the pain is loss of aliveness, depression, addiction and an unrelenting yearning for more. 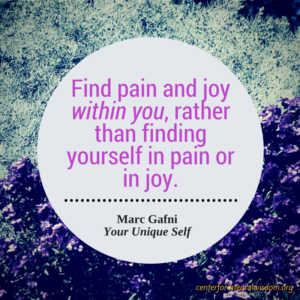 To carry out this practice, ordinary love is not strong enough to allow us to hold the pain. We need a larger love, wider and deeper love. That is outrageous love. But for now just locate outrageous love. Take a brief moment to think back on the largest love you have ever felt. Remember how in the embrace of that love there was room for everything? Now step into that love and double it. Triple it. Quadruple it. That is enough to locate the feeling tone of outrageous love. You can only respond to outrageous pain with outrageous love. Now, from that place of outrageous love, think of a pain you are avoiding. Turn into the pain and stare directly at it for two or three minutes. Do not turn your thoughts away. Do not avert your gaze. Hold the outrageous pain in outrageous love. That’s it. You have already done it. This is the first step to awakening that most people never take. Congratulations! One of the laws of reality with which we began was, “we live in an intimate universe.” To be intimate meant to be both witnessed, recognized, seen and addressed. But it also meant mutuality. Both mutuality of action and mutuality of identity. Evolutionary intimacy is realized through the symphony of evolutionary Unique Selves each committing outrageous acts of love. In this, the human becomes God’s partner and a mutuality of partnerships is formed. Deeper still when the human being awakens as Evolutionary Unique Self realizing that he or she is an irreducibly unique expression of the love intelligence and love beauty of all that is – with unique outrageous acts of love to commit – the mutuality of identity between the human being and God is achieved. The human being becomes God’s verb. You are an Outrageous Love Letter. The actual process of writing can help, but you are a LOVE Letter. Your life is a love letter. Your everyday actions are a love letter. Your energetic vibration in the world becomes a love letter. In this vision personal love and intimacy and activism are seamlessly merged which is the critical need and invitation of our generation. The natures of the challenges that confront us are insoluble in the old top down model of government and the ruling elites. It is only a bottom up model of a self-organizing universe rooted in the Unique Self principle of Outrageous Love that shows us a profoundly hopeful path forward.